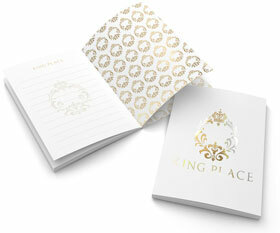 Our designers can take your size specifications and create a layout that complements it beautifully. Be sure to include both sides of the front and back cover when counting pages. Each sheet we print actually includes four catalog pages (two on the front and two on the back) which are then folded in the middle to create the catalog. This means that your page count must be a multiple of four. You can submit your catalog designs as individual pages and we will take care of the technical side of arranging them so they print in the correct order. Most catalogs are folded and bound along the long side of the catalog, but we can also fold and bind on the short side for a more unique look. If you are mailing your catalog, unusual sizes and shapes might affect the mailing cost so keep USPS regulations in mind. Catalogs are more than just a way to display products for sale. They can also help customers connect emotionally with your brand and your offerings. To boost a catalog's emotional punch, feature exotic destinations, dream kitchens, magazine style articles about designers or causes you support, or the story behind your company and your products. Custom sizes are ideal for building emotional connections because they instantly say that your business isn't like all the rest. People use catalogs for inspiration. Take advantage of this by using high quality images that help people envision themselves using your products or services. If you sell tableware, photograph it at a Thanksgiving feast or backyard barbecue. If you sell yoga gear, show it in spectacular settings. Include your web address and phone number at the bottom of each page so people will know how to take the next step. If you're mailing your catalogs, use custom sizes to help them stand out in the mailbox. People are more likely to notice things that have a different look and feel. Include codes so you can track the success of each catalog you send. When choosing custom sizes, consider your audience and the way your catalog will be distributed and used. Smaller sizes can be a great choice for trade shows, event programs and tourism guides because they're easy to stuff in a pocket or purse. Larger formats are good for annual catalogs that you want people to save, or magazine style catalogs that you hope they'll read cover to cover. If you are mailing your catalog, consider that large format catalogs will cost more to send. Unexpected dimensions like squares and rectangles bound on the short end are good attention-grabbers because they challenge people's expectations about catalogs. 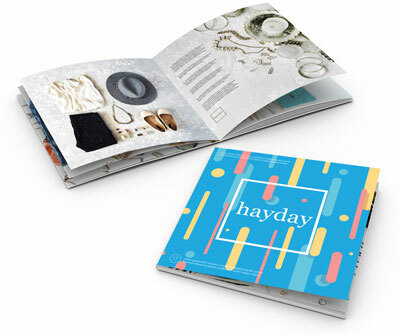 With custom sizes, catalogs can become oversized books or pocket-sized handouts. Combine custom sizes and shapes with die cuts, foil stamping and custom printing effects for an impressive look that everyone will notice. Have questions about using custom catalog sizes and shapes?